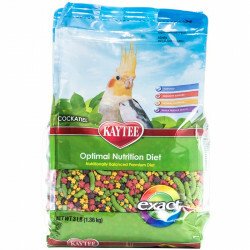 Kaytee Exact Bird Food is a premium extruded food and has been the recognized nutritional leader by veterinarians and breeders since its introduction over a decade ago. 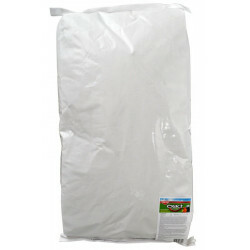 Available for birds and small animals, Exact is the most researched and widely used extruded food available. Kaytee Exact Rainbow is a nutritious bird food developed by the nutritional experts at the Kaytee Avian Research Center to provide all the nutrients proven necessary for macaws, cockatoos, all parrots, eclectus, pionus, and large conures. For baby birds, look to Exact Hand Feeding formula, a special blend developed just for new hatchlings. Exact was the first instant hand feeding formula available and is consistently recommended by professional breeders, veterinarians and conservation programs worldwide. Kaytee has included digestive enxymes in the exact mixture to aid in adequate digestion for maximum benefit to your bird's system. Be sure to browse all of our Kaytee Exact products to make sure you find just the right treatment for your pet. 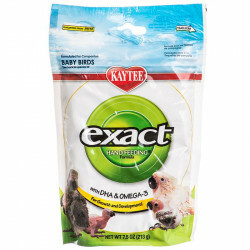 Whether you have a grown or infant bird, Kaytee Exact has a delicious, nutritious food for you. Pet Mountain is proud to offer you a wide selection of Kaytee Exact products, at the very best prices available anywhere! Take a look at all of our huge selection of great deals! Can't find something you're looking for? Let us know! We'd love to help. Be sure to check out our online coupons and discount shipping on all your favorite products.